Google’s announcement today of YouTube TV, a subscription based streaming service of live TV, has been met with mixed reviews. When you compare the service to those of DirecTV Now and Sony Vue, it certainly has big holes in the offering. It is pretty clear that Google was able to negotiate deals with the national carriers like ABC, CBS and NBC but weren’t (or haven’t completed yet at least) the big brands in cable like Viacom and AMC. That means things like HBO just aren’t there in the offering. That doesn’t mean they won’t be later, but Day One, nope. So is it worth the $35 per month price tag? It really depends on the content you are wanting to get. For sure, having the ability to stream your local stations and have them stored in a Cloud DVR has a lot of appeal. I rarely watch a show in real time. It is always on my DVR or via an app on my phone or tablet. I’m not alone, nor are you, and YouTube knows this as well. The ability to record this week’s Big Bang Theory then watch it when I have time is a big bonus. So having local channels while I’m on-the-go is nice. But the real winner for viewers may be sports. who love sports. For me, I’m a big F1 fan. Here in the US, that is broadcasted on NBCSN. This $35 per month option become really attractive when I look at the $100 per month I’m spending with Comcast. 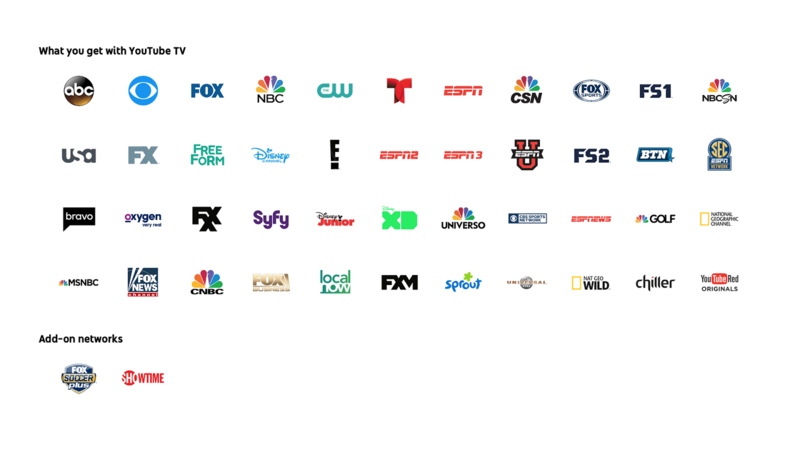 In fact, if I look at the YouTube TV lineup, 90% of what I watch is on the list. Now, to be fair, I’m not an NBA fan so I won’t miss the fact that Viacom isn’t in the mix (and that goes for the NCAA March Madness Tournament as well). MLB? I can get that via MLB directly and stream baseball on my phone or tablet. Equally, I would still be augmenting YouTube TV with things like Netflix, Amazon Prime and Google Movies & TV too. So it isn’t going to be a 100% package in my particular world. But it is close. Close enough for me to give it serious consideration when it hits the market. When that will be is going to depend on where you live and where Google has managed to get rights to broadcast. Streaming TV is completely (and probably unnecessarily) complicated. So what do you think? Is the $35 a month worth it or is it too much for too little? Leave a comment here or on G+ and share your thoughts.